In a Gallup Latin America/New Republic poll, 87% of Panamanians say he's either "not missed at all" (52%) or only "slightly missed" (35%). Ten percent responded he is "missed more than ever." The poll had a margin of error of +/-3%. The poll reflects a disturbing trend for former Latin American despots. It seems that now more than ever, out of sight is out of mind. Chile's Augusto Pinochet and El Salvador's Daniel Ortega both suffered the same fate in recent polls as well. The phenomenon is now the focus of a study currently underway by the United Nation's Initiative for Following the Popularity of Former Latin American Dictators, or UNIFPFLAD. Word on the streets about Noriega's fate in Panama's capital city Managua was mixed. "I really didn't suffer all that much. 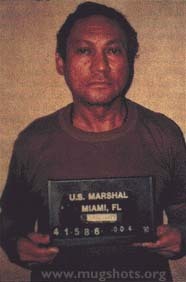 I guess he just wasn't mean enough," observed a former political prisoner, Juan de Marco. "I mean don't get me wrong, prison wasn't all roses - frequent food shortages, police brutality, occasional outbreaks of dysentery -- but honestly, what Latin American banana republic free citizen doesn't experience these things in their day-to-day anyway?" Maria Begonia-Polvorosa of 1451 Via Mariposa, Managua (who refused to give her full name for fear of retribution by the Secret Police) weighed in a contrary opinion. "There's not a day that goes by that I don't long for the glory days of ol' Pineapple Face. He put us on the world map. I mean other than the canal, what else do we Panamanians have? Hats?" Begonia-Polvorosa was of course referring to the famous Panama Hat worn by almost every single adult Hispanic male living in a tropical country south of the United States, as movie producers have led Americans to believe. "Sure, he had a bad complexion and looked like a mutt, but he was OUR mutt. I don't even KNOW who our president is now, do you?... See? We've taken a step backward if you ask me." Noriega, presently serving a life sentence in a Florida prison on trumped-up racketeering and drug charges, was shocked at the news. "I don't get it. I did my darndest to put Panama on the world stage and this is the thanks I get fifteen years later? Other the canal, what did we have? Hats? At least Panamanians know my name. I can't say that for what's his face. You know, the new president." At press time, staff researchers using the powerful search engine Google could find no record of the name or whereabouts of the current sitting president of Panama.